Jessica Alward, of Medora, knows what it is like to be busy. With four kids between six months and nine years of age, Jessica operates on little sleep while navigating through the whirlwind of motherhood. So when she became pregnant with her fourth child, Levi, Jessica started looking for ways to streamline her life. 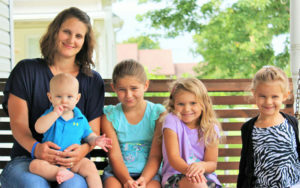 Jessica Alward and her four children. While choosing any primary provider is a hard decision, finding a pediatrician you trust your kids with makes the choice that much more difficult. Not only does the parent need to trust the pediatrician but the children also need that trust, says Jessica. The parent-pediatrician relationship last a longtime and requires conversations about everything from immunizations to bed-wetting to changes during puberty. “I talked to a lot of different people and there was one consistent answer,” Jessica said. “The new pediatrician at [OSF] Saint Anthony’s was who everyone recommended, Dr. Ameera Nauman. And I was delivering Levi there, so I met with her. Jessica found what she was looking for: a pediatrician with a rapport with her entire family and who is gentle and kind with the kids. It did not take long for Jessica to evaluate her decision to switch all of her children to Dr. Nauman. That summer, along with having a newborn, two of the Alward’s daughters had minor accidents that needed additional medical attention. Dr. Nauman called and spoke with the emergency medical staff while the Alwards were on their way to the hospital. With her office being located on the OSF Saint Anthony’s campus, Dr. Nauman was able to easily do all of their follow-up care. Understanding how difficult making appointments are, when possible, Dr. Nauman allows parents flexibility of scheduling additional children for one visit, saving parents multiple trips. If you would like to schedule an interview with Dr. Nauman, call (618) 462-2222.